I spotted this maxi-fuse setup in a 1997 Cadillac Catera. This is what they look like separated from the base. What I am looking for is a replacement terminal kit, so I can finish it out as a more professional looking rather than the hack job that I have in my car right now. Sure, I could 'splice and dice' (and probably will for the first one - I really like the look of this maxi-fuse setup. I looked on AMP's website, could not find any info on any of the following part numbers. It does appear as though the stamping of ''>PA66-GF13<'' is the material it's made of. All items are embossed with the "GM" logo and "AMP" identifying marks. 964730-1 black cover (not shown) - has a GM logo with identifier of "ZF6-4"
THIS is EXACTLY what I have been looking for!!! Low Buck Solution! NOW I can fix the problem that derailed my car the way I want to. 1) I initially checked on AMP's website for the plastic housings, terminals and such, and could not find a match to the numbers indicated on the part. 2) I checked with the local AMP dealer with the parts in hand and "sorry, can't help you..."
A) Cadillac sells the "Block, Pwr Distr-Fuse" unit [GM P/N 90494449] (not sure what all comes with it) for sixty bucks and some change. Darn cheap for something that goes in a Caddy IMHO. I think I found the part number(s) for the terminal. However, I want to be very sure that what I am looking at on-screen is the same thing I pulled out of the connector assembly last night. Question is (since there is not an option to create a poll in this thread now), anyone intersted in purchasing new terminals to use this setup in their project? Finally got around to installing this setup. 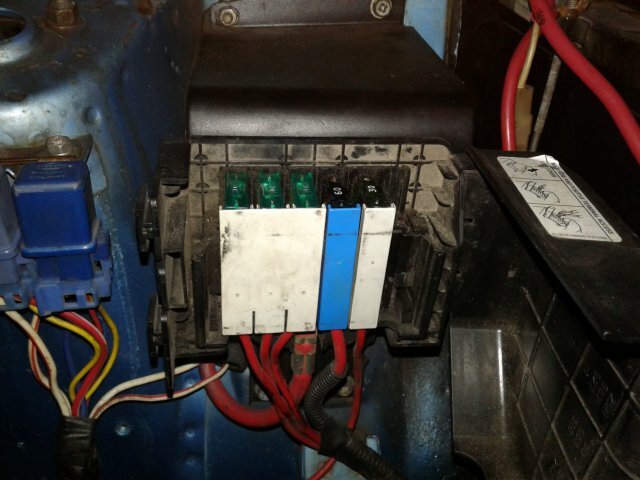 Electrically speaking, the output of the alternator is still fused and I have an extra two junctions, one for the headlight relays, one will be for the electric fan. Looks nice - by all appearances it appears to be less troublesome to maintain. If salvaged correctly from the donor car (carefully slice open donor wiring harness at the right front of firewall behind strut tower, cut the (3) 10 ga red wires, remove 3 way modular housing), you should be able to harvest enough wire length to make the spliced connection on the inside of the passenger cabin. OK I rewired my car and am scratching my head where fusible links go? Everything is fused already? You can't fuse the starter wire. The alternator wire (at least on the '02 donor Z28) goes straight to the battery. This leaves the one wire that goes from the battery to the fuse block? The Camaro harness has some fusible links in them as well as the large 'Maxifuses'. I'm only using the Maxifuses but am concerned I need the fusible links somewhere. Searching just confused me more so can someone please explain exactly which wire we're trying to protect - I assume it's the one up to the fuse block? This went all the way to the ignition switch and back on the Z28 which is I assume why there was the fusible links added as there are a lot of potential shorts along the way. Mine is about a foot long so I dont see the point. Any insight would be helpful. What all vehicles might have this sort of piece in them? I am WHOLLY (or should I say Holy?) ignorant of 'Merican cars, and I want one of these!! Its high time I started dealing with my car, wheels are turning that are going to allow that.. and THIS is the first and foremost problem. As I said above, Thankyou!!!! snipped...where fusible links go? Everything is fused already? You can't fuse the starter wire. The alternator wire (at least on the '02 donor Z28) goes straight to the battery. ...can someone please explain exactly which wire we're trying to protect ...? FWIW, the un-fused output of the alternator went to the other side of the ignition relay, the 'back half' of the fuse block and the voltage regulator. Is this what you were asking? Again, I haven't studied the diagrams for other models, so it would be a guess on what the fusible link(s) were protecting on the earlier ones. Thanks for the info. On the donor '02 Z28 the alternator went unfused to the battery which is what I'm planning. The ECU is fused, I'm not using the combo switch (no wipers and headlights are on a fused toggle switch/relay), and I'm also not using the ignition switch (ignition is on a fused toggle switch/relay). So I'm still thinking there is no need for one anywhere. Again the only thing not fused is the alternator output which was not fused on the Camaro either and the very short wire from the distribution stud to the fuse block. I think I'm covered but would be interested if anyone thinks I'm missing something. I know this is a 10 year old thread but did anybody ever find out about replacement terminals for the Catera Block fuse holders? Had to dig and find my old hard drive from the old PC (3 PC's ago). Dang, I did this all in late 2007. I was able to locate the contacts from TGS Onlineshop (Europe) http://shop.t-g-s.de/ , and POSSIBLY from http://www.eagleday.com/ (Eagleday changed the part numbers of the actual part, so being able to compare all the data was an educated guesstimate, but I never ordered those terminals from them, other stuff, but not the subject terminals. ), but I was able to salvage sufficient lengths of wire from the donor car(s) by isolating the wires inside the cabin, as the harness enters behind the dash on the drivers side, and extract the wires from the harness by pulling from the engine bay. I was able to request samples from AMP (now Tyco?) but they did not have any terminals available for 10 gauge wire, and although I was able to source some Paladin ratchet style crimp pliers (those were well WORTH the $$), I did not obtain the dies required for the larger wire size. I would like to upgrade my current setup to use a heavier gauge wire from the alternator) to feed the fuse block (and in turn, the battery). Hope this helps what you were looking for. Hope this helps others in updating the vulnerable fusible links.